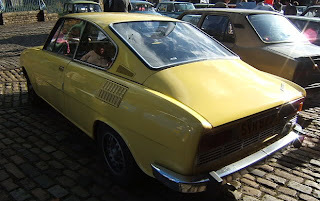 The Škoda 110 R was a rear-engined, rear-wheel drive car that was produced by Czechoslovakian manufacturer AZNP in Kvasiny, between 1970 and 1980. During those ten years, a total of 56,902 coupés were made. 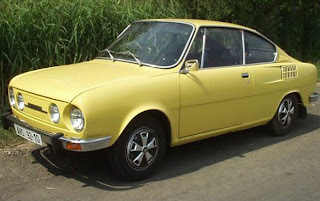 The 110R Coupé succeeded the sporty Škoda 1000 MBX/1100 MBX. It used all the same mechanical components as the Škoda 100/110saloons but with an uprated 62 bhp (46 kW) SAE, 52 bhp (39 kW) (DIN) version of Škoda’s 720-type OHV four-cylinder 1.1-litre (1,107cc) engine. With a four-speed manual gearbox, the 110 R could reach a top speed of 145kmh and accelerate to 100kmh in 18.5 seconds. Its design closely mirrored that of the related 100 saloon, but with only two doors and a distinctive fastback rear. Most of the vehicles featured four headlights, but the earliest models had only two. Last updated on 2 March 2013 at 05:49.